There	is	deposition	of	beta	amyloid	in	the	walls	of	small	and	medium-sized	blood	vessels	[Pantoni	2010]. CAA	is	a	distinct	cerebral	process	alone	and	is	unrelated	and	should	not	be	confused	with	the	systemic	amyloid	deposition	diseases. A	more	inflammatory	variant	of	CAA	which	can	be	steroid	responsive	has	been	detected	[Moussaddy	2015]. Deposition	of	amyloid-β	fibrils	in	the	wall	of	the	small	and	medium-sized	blood	vessels,	mostly	arteries	of	the	leptomeninges	and	cerebral	cortex. CAA	has	been	found	commonly	in	those	with	Alzheimer	disease. Only	a	minority	of	those	with	CAA	develop	Alzheimer	disease. There	is	an	increased	risk	of	dementia	in	those	with	ICH. There	is	a	genetic	association	with	apolipoprotein	E	gene	epsilon	2	and	4	alleles. Dutch	type:	late	middle	age. ICH. Amyloid	deposition. Some	get	dementia. Defect	in	amyloid	protein	precursor	protein	(APP)	gene	on	chromosome	21. Icelandic	type:	Presents	young	adults	with	ICH. Dementia	seen. Involves	brainstem	and	cerebellum	too. Mutation	of	the	cysteine	protease	inhibitor	cystatin	C.
Cerebral	amyloid	angiopathy	is	a	major	cause	of	haemorrhagic	stroke	in	older	patients. There	is	localised	amyloid	deposition	which	increases	vessel	wall	fragility	which	leads	to	increased	bleeding	risk. Suspect	amyloid	if	lobar	bleeds	are	seen	in	those	over	age	>	70	without	evidence	of	pre-existing	hypertension. By	lobar	we	are	referring	to	the	cortex	and	subcortical	white	matter	in	distinction	to	the	deep	hypertensive	bleeds	affecting	putamen,	thalamus	and	pons. CAA	bleeds	are	slightly	commoner	in	temporal	and	occipital	lobes	rather	than	frontal	and	parietal	lobes. The	main	differentials	of	a	lobar	bleed	will	be	extension	from	a	large	putaminal	haemorrhage,	Haemorrhagic	transformation	of	an	infarct,	arteriovenous	malformation	(AVM)	or	Haemorrhagic	tumour. An	inflammatory	form	of	amyloid	often	with	distinct	MRI	changes	which	may	not	always	parallel	clinical	changes	has	been	found	and	is	called	Cerebral	amyloid	angiopathy-related	inflammation. Has	also	been	called	cerebral	amyloid	angiitis	and	cerebral	amyloid	inflammatory	vasculopathy. CAA-RI	as	it	is	termed	presents	with	focal	neurology	and	imaging	demonstrates	vasogenic	oedema	involving	the	subcortical	white	matter	with	possible	some	leptomeningeal	enhancement	and	microbleeds	are	seen. Clinically	the	course	can	be	recurrent	as	there	is	a	predisposition	to	further	bleeds. Bleeds	may	be	brought	on	by	falls	or	trivial	trauma. Some	cases	can	be	relentless	with	reoccurring	bleeds	which	follow	an	initial	event,	a	sort	of	'primary	progressive'	pattern. These	are	then	followed	over	a	year	or	so	by	further	anatomically	related	and	unrelated	lobar	bleeds	for	which	little	can	be	done	other	than	to	stop	all	anticoagulants	and	look	at	falls	risk	and	manage	any	co-existing	blood	pressure	which	may	coexist. As	soon	as	the	patient	gets	over	one	episode	they	come	back	with	a	further. Patients	with	CAA	can	simply	have	transient	neurology	with	a	TIA	like	syndrome	or	focal	seizure	type	episode. A	real	concern	when	many	of	us	do	TIA	clinics	with	limited	access	to	MRI	and	an	assumption	that	such	episodes	are	most	likely	thrombotic. CT	is	unlikely	to	pick	up	small	especially	non	acute	microbleeds	especially	as	presentation	to	the	TIA	clinic	may	be	after	days	or	even	weeks. Definite	cerebral	amyloid	angiopathy a	full	post-mortem	examination	reveals	lobar,	cortical,	or	cortical	/	sub-cortical	haemorrhage	and	pathological	evidence	of	severe	cerebral	amyloid	angiopathy. Probable	cerebral	amyloid	angiopathy Pathological	confirmation	not	required. Patient	older	than	55	years. Appropriate	clinical	history. MRI	findings	demonstrate	multiple	haemorrhages	of	varying	sizes	/	ages	with	no	other	explanation. Possible	cerebral	amyloid	angiopathy	 Patient	older	than	55	years	with	appropriate	clinical	history. MRI	findings	reveal	a	single	lobar,	cortical,	or	cortical	/	sub-cortical	haemorrhage	without	another	cause,	multiple	haemorrhages	with	a	possible	but	not	a	definite	cause,	or	some	haemorrhage	in	an	atypical	location. The	Boston	criteria	were	first	proposed	to	standardise	the	diagnosis	of	cerebral	amyloid	angiopathy. They	comprise	of	combined	clinical,	imaging	and	pathological	parameters. They	provide	a	useful	list	of	criteria	for	research	and	comparing	similar	groups	of	patients. Using	these	criteria	in	most	cases	without	post	mortem	or	brain	biopsy	we	can	therefore	only	suggest	that	our	patients	have	Probable	or	Possible	CAA. CT	Brain:	acutely	this	will	show	a	single	or	possibly	more	than	one	lobar	haemorrhage	in	a	superficial	location. There	maybe	local	extension	to	the	subarachnoid	or	into	the	ventricles. As	time	passes	there	may	be	an	accumulation	of	bleeds. Bleeds	tend	to	be	more	common	in	the	frontal	and	parietal	lobes	both	cortically	and	subcortical. Posterior	structures	including	cerebellum	and	deep	nuclei	can	be	affected	but	usually	the	traditional	sites	for	hypertensive	bleeds	such	as	putamen,	thalamus	and	pontine	are	avoided. 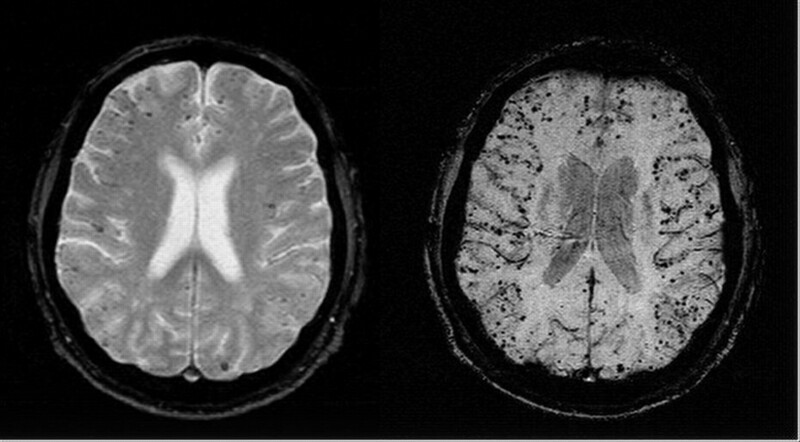 MRI	Brain:	using	the	Gradient	echo	or	T2*	sequences	is	very	sensitive	at	detecting	haemosiderin	a	break	down	product	of	blood	and	therefore	indicating	evidence	of	old	bleeds. Brain	Microbleeds	may	suggest	subclinical	CAA. They	are	seen	in	5-20%	of	the	population	depending	on	population	studied	and	radiological	techniques	in	their	imaging	diagnosis	[Rosand	J	et	al. 2000]. These	have	been	defined	radiologically	as	homogeneous,	round	foci,	<	10	mm	diameter	(no	minimum	size	was	specified),	of	low	signal	intensity	on	GRE	T2*-weighted	MRI. They	need	to	be	differentiated	from	lesions	compatible	with	an	infarct	with	haemorrhagic	transformation	[Cordonnier	et	al. 2009]. Microbleeds	are	commoner	in	those	taking	anti-thrombotic	agents. Those	with	CAA	RI	will	usually	have	dramatic	T2	changes	of	oedema	which	may	be	out	of	proportion	to	clinical	signs. CTA/MRA/CTV:	may	be	needed	when	other	aetiologies	are	being	considered. Enigmatic	radiological	changes	seen	on	certain	imaging	modalities. Importantly	not	seen	on	CT	or	standard	MR. They	are	defined	radiologically	as	small,	rounded,	homogeneous,	hypointense	lesions	on	T2*-weighed	gradient-recalled	echo	(T2*-GRE)	and	related	MRI	sequences	that	are	sensitive	to	magnetic	susceptibility. Histopathological	correlation	suggests	that	they	are	due	to	tiny	bleeds	adjacent	to	abnormal	small	vessels,	usually	due	to	chronic	hypertension	or	cerebral	amyloid	angiopathy	(CAA). There	is	an	association	with	cerebral	haemorrhage,	cognitive	decline	and	Alzheimers	but	also	seen	in	older	population. Exact	risks	are	being	determined	as	it	adds	another	issue	to	the	concerns	and	difficulty	of	decision	making	around	using	antithrombotic	and	anticoagulation	in	many	patients	at	risk	of	thromboembolic	disease. Can	closely	mimic	primary	angiitis	of	the	central	nervous	system. It	is	a	relatively	rare	syndrome. Diagnosis	usually	made	on	biopsy. Responds	to	steroids. There	may	be	lobar,	white	matter,	nonenhancing	hyperintensities	on	T2-weighted	sequences.Positron	emission	tomographic	scan	may	show	diffuse	uptake	of	11C-Pittsburgh	Compound	B	in	inflammatory	cerebral	amyloid	angiopathy	[Moussaddy	2015]. There	are	two	subtypes	which	are	inflammatory	CAA	(ICAA)	and	amyloid-β-related	angiitis	(ABRA)	according	to	histopathology. ABRA	is	preferred	if	the	lesion	enhances	on	MRI	and	requires	combination	drug	therapy. ICAA	is	highly	suspected	with	ApoE	genotype	of	ɛ4/ɛ4	[Chu	et	al. 2016]. CAA	RI:	A	significant	proportion	of	patients	respond	readily	to	treatment	with	treatment	with	corticosteroids. Take	expert	help. Moussaddy,	et	al. 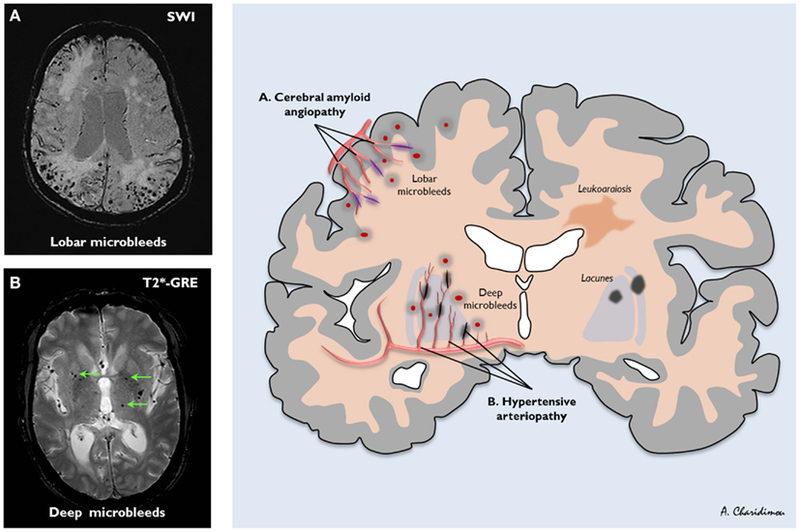 Inflammatory	Cerebral	Amyloid	Angiopathy,	Amyloid-β–Related	Angiitis,	and	Primary	Angiitis	of	the	Central	Nervous	System	Similarities	and	Differences. Stroke. 2015;46:e210-e213. Chu	et	al. Cerebral	Amyloid	Angiopathy	(CAA)-Related	Inflammation:	Comparison	of	Inflammatory	CAA	and	Amyloid-β-Related	Angiitis. Journal	of	Alzheimer's	Disease,	vol. 51,	no. 2,	pp. 525-532,	2016. Knudsen	KA,	Rosand	J,	Karluk	D	et-al. Clinical	diagnosis	of	cerebral	amyloid	angiopathy:	validation	of	the	Boston	criteria. Neurology. 2001;56	(4):	537-9.